Palm oil is a nutritious and versatile ingredient that has a range of manufacturing applications. But if you’re concerned about the sustainability of palm oil, you’re not alone. From deforestation to unfair labor practices, there’s certainly a lot of work to be done to clean up the category. 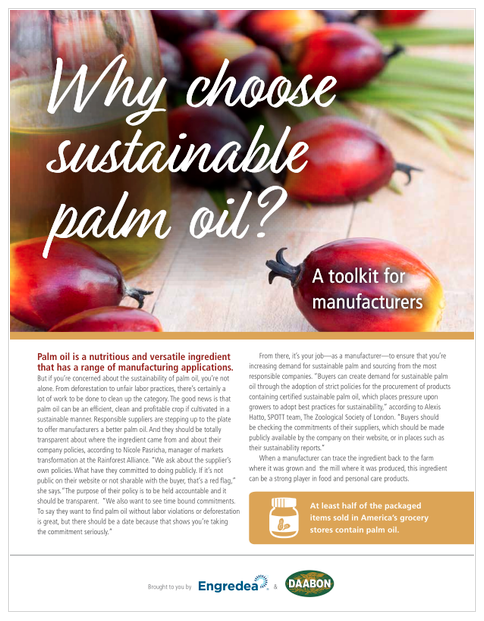 The good news is that palm oil can be an efficient, clean and profitable crop if cultivated in a sustainable manner. Download this manufacturer's toolkit to learn more.